Whether is is a tasting event hosted by our highly skilled sommelier team at one of our tasting centres, or an expertly paired dinner at a popular YYC eatery, there is something for everyone! An all-encompassing course designed for the wine enthusiast who wants to increase their knowledge and an industry standard for professionals. This course covers all the major grape varieties, where they are grown, and how to taste wine using the Systematic Approach to Tasting. If Burgundy is the heartland of French wine, Bordeaux is the cosmopolitan ballroom - a merchant driven port town, famous for its shopping and glitzy lifestyle. The wines follow suit, offering up grand images of country side chateau (castles) and a hedonistic lifestyle. Italy is known as the land of the vine. With thousands of indigenous grape varieties and hundreds of recognized wine styles, there’s much to explore beyond Chianti, Valpolicella and Pinot Grigio’s. An advanced course, designed to provide detailed analysis of the principal wines and spirits of the world. In this six-day course students will gain in-depth knowledge of wine production, global wine regions, spirit and liqueur production, as well as fortified and sparkling wine. Hands down one of California’s premier wine regions, producing memorable Pinot Noir, Chardonnay, Petite Sirah and Zinfandel, Russian River is a must exploration for any wine enthusiast. Have you ever dreamt of visiting the south of France and sipping wine under the sunset with scents of lavender in the air? Cinco de Mayo can’t help but seem like a marker of the arrival of Spring. We will celebrate all things Mexican-American and rejoice in its colourful character and flavourful libations. Riedel has been famous for the art of glass making since 1756, and produce a style of glass for every style of wine. Differently shaped glasses enhance certain aromas and flavours – as well as your ability to perceive them. Join us for an evening of decadent wines from Paso Robles California featuring the Hope Family Wines. 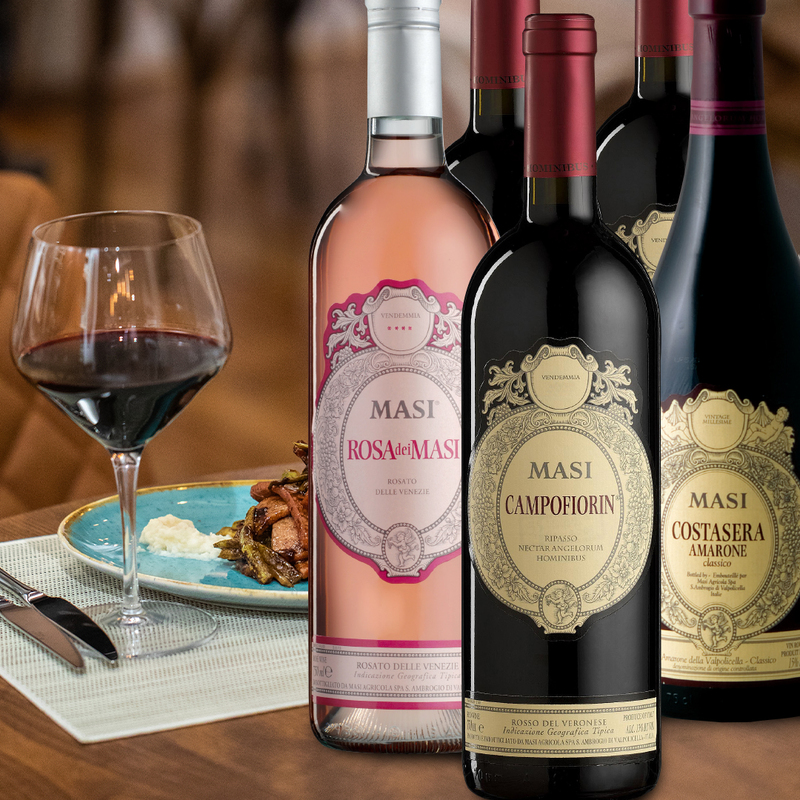 Enjoy an evening of fine wine and food at the Masi Wine Dinner with guest speaker Luc Desroches of the Masi Technial Group. Cotto Italian Comfort Food is excited to host this event. We are getting our Rosé on this Spring and we suspect a lot you are too! Momentum is still moving on up for this once maligned and misunderstood wine style. Join us for an exploration and celebration of Spain’s most recognized vineyard area through the lens and wines of Bodegas CVNE. We are pitting these two Goliaths of the wine world head to head. Both with diverse wine styles, climates and quality levels this will be a tough battle. In the heart of Tuscany a small medieval town sits atop a hill. With its cobblestone walk ways and sweeping views of a beautiful countryside, Brunello Di Montalcino delights any wine drinker lucky enough to uncork her noble wines. Deep in the heart of France’s Southern Rhone Valley is an appellation producing some of the finest of French wines. In 1308, Pope Clement V relocated the papacy to Avignon and brought with it a love and understanding of the vine. The Italian wine boot that is. This fun, walk around, festival style tasting will feature dozens of wines from all over the Italian boot. Some go to favourites alongside new and exciting options for the Italian wine enthusiast. Compare and contrast a collection of wines from the New World against classic styles from Old World regions and be the judge as to which style you prefer best. Have you ever been confused about which wine goes with which cheese? Trust us when we say you’re not alone and that we are here to help. There is a mantra when choosing wine for some…ABC – Anything But Chardonnay. But if you’re anything like us, you feel the exact opposite! How about? Amazing Buttery Chardonnay! Collector wines and some must haves for any burgeoning and enthusiastic wine lover. Not everything for the cellar has to break the bank, we are promising great buys and unique opportunities side by side. You know what Dad really wants, a whisky tasting!